The U.S. state of Texas has had many oil booms and busts. A new one is underway by the technique of fractionating ("fracking") shale/dolomite formations. A "boom" in nonrenewable resource extraction from the Earth is defined as a time period in which extraction is occurring very fast in a given area; thus, many workers come in from outside the area to man the drilling rigs, to build housing for the oil workers and to provide other services for the increased population. 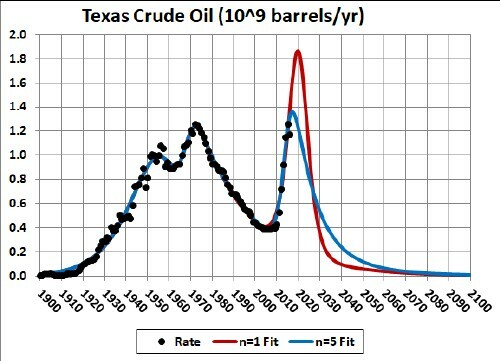 This article shows mathematically that the current Texas crude-oil boom will become a bust within a decade. A "bust" in nonrenewable resource extraction from the Earth is defined to begin at the time when extraction of the resource peaks and then falls to negligible amounts over a time period. The U.S. Energy Information Administration gives monthly and annual crude-oil extraction data for Texas since 1981. Earlier data are available back to 1905. Those data are fitted by a depletion function, the Verhulst function, in this study to determine when the extraction will peak. The data and the fits to the data are given in a later section. A reliable estimate of reserves is needed to fit extraction data by a function for projecting into the future for a nonrenewable resource Here is a good definition of reserves of a nonrenewable resource. The curve is a fit to the 4 last data using the Verhulst function described in the next section, assuming that the curve will be symmetrical. 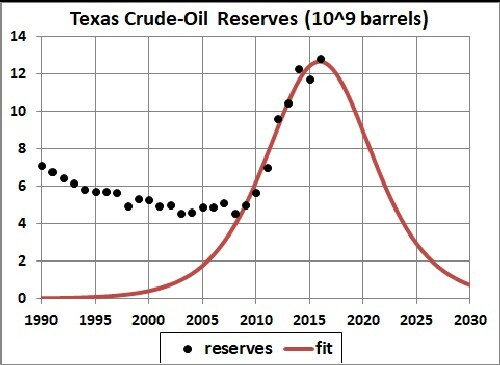 Since the reserves estimates have been rising each year since 2007, the fit is done to get a rough estimate of the peak value of the reserves estimate in the future, which is ~16.6 x 109 barrels. The asymmetry parameter, n, must be greater than 0. The maximum of P(t) occurs at , which yields the peak value . For the symmetric case (n=1): and . The final large peak in the red curve is assumed to be symmetric. Asymmetry would shift the peak backward for n >1 (depletion curve skewed forward with a smaller peak) and forward for n < 1 (depletion curve skewed backward with a larger peak). The blue curve is for n=5, a value that is close to what J. David Hughes finds in his detailed micro-analysis of extraction of tight oil by fracking in the U.S. The area under the curve is equal to the amount already extracted (~67 x 109 barrels) plus the reserves value (~106.6 x 109 barrels). 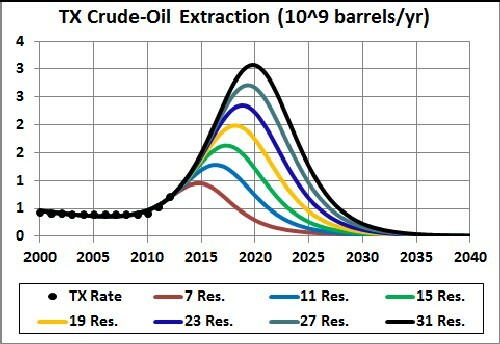 Even if this very high reserves value (~16.6 x 109 barrels) is correct, the final peak occurs at year ~2020. The onset of the bust could be extended out to later years by imposing environmental regulations and/or taxes on the extraction of natural gas, thereby reducing the extraction rate. The area under each curve is equal to the amount already extracted (~68 x 109 barrels) plus the reserves value. This has a logarithmic behavior as expected mathematically. That is, the rise in the peak year increases much less than linearly with the rise in reserves. The exponential rise rate approaches ~2.6 years as the reserves values get larger. This is a fast rise rate! The lower the chi square the better the fit. Even for very high estimates of crude-oil reserves for its extraction in Texas, the current boom will turn into a bust within a decade. It would be wise for Texas to use the current crude-oil boom to build the policies and infrastructure for collecting energy from wind and solar, for encouraging drivers to drive electric vehicles and for fast charging stations for electric vehicles in personal and parking garages. Wind energy in Texas has a good start already. It would be wise for the govenment of Texas to do some decade-long planning about how to best manage the coming crude-oil-extraction bust. A tax on crude-oil extraction to put in a fund to help manage the bust and to clean up the mess made by the extraction would be wise. Such tax might have an added benefit of slowing down the extraction so that the bust will not occur so soon, giving more time to prepare for it. A similar analysis has been done by the author for natural-gas extraction for Texas. A similar analysis has been done by the author for crude-oil extraction for North Dakota. A similar analysis has been done by the author for crude-oil extraction for Oklahoma. A similar analysis has been done by the author for crude-oil extraction for United States. A similar analysis has been done by the author for natural-gas extraction for North Dakota. A similar analysis has been done by the author for natural-gas extraction for Pennsylvania. A similar analysis has been done by the author for natural-gas extraction for Colorado. A similar analysis has been done by the author for natural-gas extraction for Oklahoma.